This Marines Veteran Garden Flag and Holder set includes our 12x18 inch officially licensed garden flag and garden flag holder with rubber stoppers. The garden flag holder is the recommended holder to proudly display this garden flag anywhere in your yard, flower pots, garden, or entranceway. Our garden flag hangs vertically, measures 12x18 inches, provides a top sleeve for insertion of the included garden flag holder, and is constructed of 1 ply polyester with screen printed insignias which can be viewed on both sides with the opposite side being a reverse image. Per US Military Specifications, this garden flag is made and assembled in the USA. 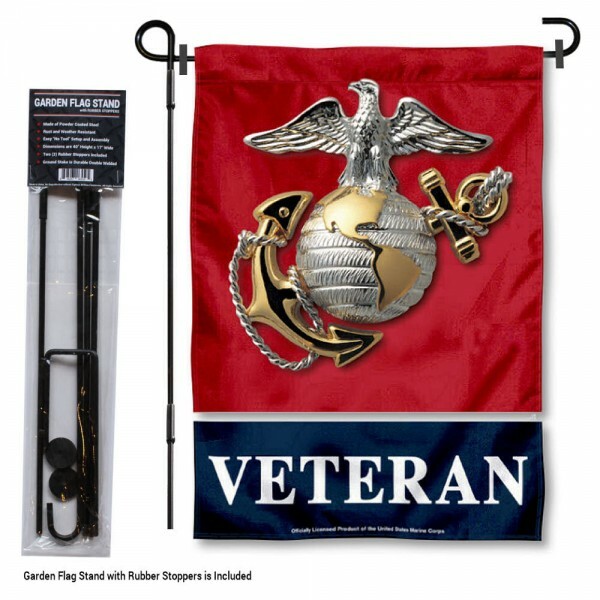 This Marines Veteran Garden Flag and Holder set is a great gift and includes the recommended flag stand hardware so it's ready to install and to fly proudly!